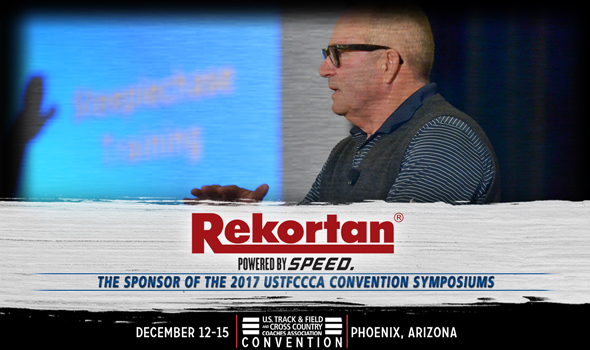 NEW ORLEANS – The U.S. Track & Field and Cross Country Coaches Association (USTFCCCA) is pleased to announce that long-time supporter REKORTAN is the presenting sponsor of the technical symposiums at the annual USTFCCCA Convention for the next five years. This year the USTFCCCA Convention will be held from Tuesday, December 12 and run through Friday, December 15 at the JW Marriott Desert Ridge Resort & Spa in Phoenix, Arizona. Like last year, there will be 32 technical symposiums spread across four days. Each of the four main track & field disciplines – sprints/hurdles, endurance, jumps and throws – will be covered across eight sessions by some of the top coaches around the country. Among this year’s featured speakers are Princeton’s Jason Vigilante, South Dakota’s Derek Miles and the legendary Dan Pfaff. REKORTAN is designed for the current day athlete. Our track system is diverse and world class, offering the IAAF’s most Certified Class 1 & Class 2 Track Facilities in the world. Four decades have passed and the REKORTAN name continues a tradition of excellence, representing the most technologically advanced running surfaces in the world. Visit our booth at Convention and see the most advanced speed training (REKORTAN SMARTRACK) device in the industry. REKORTAN is a product of Advanced Polymer Technology, based out of Harmony, Pennsylvania.